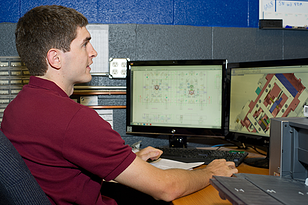 Profiles in Design and Engineering: Michael! I come from a great family! I grew up just a few miles from our current office location. I attended The Pennsylvania State University and received my degree in Mechanical Engineering with a minor in Product Realization and a certificate in Engineering Design. I’ve been working here at Creative Mechanisms since I graduated in 2009. I currently live in Warrington, PA. I am the Engineering Manager. I am typically responsible for the early technical discussions related to each job we are involved in. From there I work with our team to develop estimates and proposals. Once a job is approved, I do my best to determine which of our team members are best suited to work on each project. Then I do my best to keep all of our work on schedule and within budget. I am in constant communication with our customers throughout the life of a project so everyone is aware of progress. In addition to that, I also contribute just like everyone else here by designing, engineering and prototyping on projects. I am also our resident “electronics guy” - I don’t really have much formal electronics training but I have taught myself a lot and learned a lot online. We have done some pretty impressive electronics projects, so I am proud of that. I’ve also always loved to build stuff, from little models up to big skateboard ramps and everything in between. Here at Creative Mechanisms, I get to build things every day, and I’m usually “building” something new every couple of weeks. We can pick up on a project from many different stages of development. But in general, we offer the most amount of help by being able to offer our expertise related to mechanism design, materials, and manufacturing methods. At times, we need to have an artistic eye, other times we need to be very calculated and scientific. I think our broad range of experience and expertise allows us to consider all aspects of a project. We are also very proficient at making prototype models. Prototyping is often very different from full scale manufacturing. We offer many solutions that allow our customers to more easily make the transition from concept to engineering to prototyping and finally to manufacturing. We have delivered on items that our customers once thought were impossible. We have clients that will say things like “I trust you guys, you can figure it out and tell us what to do.” That comes from their previous experience working with us. We have a way of figuring things out, especially when others might get stuck. We work in a proper team setting and truly care about the quality of products we are involved with.